New Yorkers (and the tourists who come to the city) love their Apple gear, it seems, and five stores in Manhattan just isn’t enough. Just last night we reported that Apple was planning to open a new Store in the New World Trade Center complex. The race to #6 after Soho, Meat Packing District, 5th Avenue, Lincoln Center, and Grand Central is on as ifo Apple Store reports that Apple is planning to open a sixth store on the island in a former bank building on Madison Avenue next year. New York state Comptroller Thomas DiNapoli’s latest audit suggested the Metropolitan Transportation Authority gave Apple an unfair advantage last year when the company bid for a spot in Grand Central Terminal. DiNapoli’s report notes that Apple had been in private talks with the MTA for more than two years leading up to the bidding process. In a saucy move that was rejected by the MTA, Apple even tried to get reimbursed by taxpayers for the initial $2 million it had paid the restaurant Metrazur to vacate the balcony atop the historic commuter hub, the report found — a deal that ultimately was worth $5 million. “The MTA’s lease process with Apple was open, transparent and followed both the spirit and letter of the law,” Lhota contended. Apple opened its doors in Grand Central’s last winter and pays $1.1 million in rent for 2012, which the audit noted is below market, and the company notably does not share a percentage of its sales with the MTA. It is the only retailer at the station with such a deal. On the plus side, there is an awesome Apple Store with free Wi-Fi in Grand Central Station! 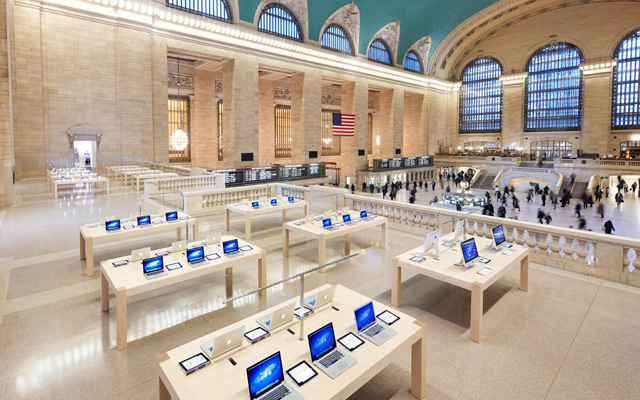 Apple currently has only one other Apple Store in New York City outside of Manhattan that is located in Staten Island. Things could change, however, according to a new report from NY Daily News that clamed retail developer Yeheskel Elia is working with Apple to bring an “iconic store” to Queens, New York. The specific location of the store would be Austin Street in Forest Hills. Nothing is official because Elia and Apple are still working on more details. Elia said he would do anything to bring an Apple Store to the bustling area. If a deal is reached, Elia said a store could open in under a year. Several months ago, an Apple broker also reached out to Elia regarding the new store. The deal would be a “kick in the pants” to the neighboring rival Brooklyn who, with borough president Marty Markowitz and local hipster legions, has campaigned nonstop for an Apple Store for years. When NY Daily News reached out for comment from Apple, in a typical fashion they responded, Apple has “made no announcements” regarding a NYC store outside of Manhattan (sorry Staten Island). [vodpod id=Video.15812105&w=650&h=420&fv=videoGUID%3D%7B645A7F70-4DE7-48FF-8058-03B54A358C3C%7D%26amp%3Bplayerid%3D2001%26amp%3BplyMediaEnabled%3D1%26amp%3BconfigURL%3Dhttp%3A%2F%2Fm.wsj.net%2Fvideo-players%2F%26amp%3BautoStart%3Dfalse] As a Grand Central commuter, Late night talk show host Jimmy Fallon articulates my feelings on two great things coming together. There isn’t much here that you didn’t see yesterday but it is satisfying to see the MTA’s pride in the accomplishment, which may also be in response to concerns that Apple got a ‘sweetheart deal‘.